And as the two men sat next to each other looking out at the deserted streets and canals, neither one knew for certain if this was the dawn of a new world or just the demise of the old one. The limo pulled up to the Main Ballroom of the Royal Windsor Hotel in the heart of Brussels. The hotel was teeming with Europe’s top leaders who had gathered for unprecedented emergency meetings dealing with the aftermath of the Rapture. With the U.N. proving to be fruitless—unable to do anything of substance in this true world emergency—the world craved a leader . . . any leader who could give some hope. So here they were, a mass of leaderless European elite holding emergency meetings to deal with issues that socialism couldn’t solve. In admitted desperation, they had invited leaders from all over Europe to join them as they clumsily addressed the horrible consequences of the Rapture and Israel’s continued annihilation of her enemies. Not to mention the weather seemed to have changed worldwide, about 10 degrees warmer. In the Main Ballroom the hotel’s air-conditioning struggled to keep the room under 80 degrees. The sheer numbers of hungry, godless people assaulting a hotel or large restaurant often meant that a few lucky souls would actually make it to the food storage in hopes of having just one bite to stave off the hunger pains. When a person is starving, it’s worth taking the chance of getting shot. 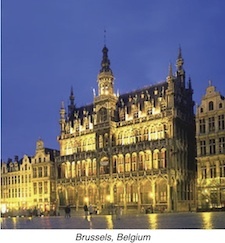 Brussels had been traditionally frowned upon as a European diplomat meeting place. It offered no beaches or mountains and no envious settings for world leaders to clamor for. But post-Rapture, the less distance to travel the better. Transportation to anywhere was at a premium and border crossing was especially difficult to arrange. Belgium sits between France, Germany and Great Britain, the most important nations still left standing. And Belgium had almost no one missing from Rapture, so little disruption was felt once the electricity began working again. Interestingly, news of the meeting also caught the attention of the Middle Eastern Arab leaders of the five countries still standing after the nuclear exchanges. These Arab leaders knew they were a gnat’s eyelash away from being wiped out by Israel. As odd as it sounded, Israel was now the big dog in the world. Having taken out Russia, Iran, Syria, Lebanon, Gaza, and the West Bank, she now had her sights trained on Saudi Arabia, Iraq and Egypt. And the Arabs were totally defenseless and the Israeli military was determined to finish the job of eliminating those countries who were bent on destroying her. She saw this as her golden opportunity to forever silence her enemies. For years Israel had restrained herself from retaliating when the Arabs targeted her malls, restaurants and buses with homicide bombers. 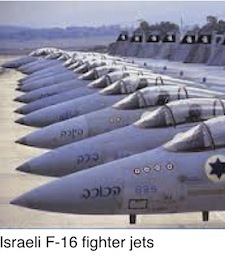 They waited patiently for peace as the Arabs fired tens of thousands of missiles at their homes and businesses. But not anymore. Israel took advantage of the window of opportunity and annihilated her four nearest Arab enemies, and another five were in her sights. It was just a matter of time before Israel again pulled the trigger to finish off the once falsely proud Muslim nations as they were no match against the incredible Israeli military might. Knowing their days were numbered, the Arabs were pushing for any kind of peace treaty. So, not surprisingly, they spared no cost to make it to the meeting in Brussels and were pleading with anyone who would listen to their plight. Normally with this many world leaders in one spot the noise in the Ballroom would be considerable. But not this time. Instead of pride driving accomplishment, once bold and brash leaders talked in almost a whisper. Everyone wanted answers, but no one had any. The Prime Minister of England and the French President made their way into the room, both looking quite humbled. The fact they were both talking one-on-one showed things had hugely changed. It was definitely a new world dawning. Television cameras beamed the images of the leaders discussing various ways to deal with the growing shortage of clean potable water as well as feed a hungry world. But there was little agreement on anything, and the world continued to disintegrate by the hour. He traveled with no entourage, only a single aide constantly at his side. The world was desperate for a leader, and these two new guys out of nowhere seemed to be the only ones offering tangible answers to a world in chaos. In the middle of the auditorium, a man from Norway immediately stood up and shouted, “Who is this nut-case? Who has given him the right to speak to us?” As all eyes in the room looked back at the podium, his cohort standing just to the left of him raised his right arm and pointed directly at the Norwegian heckler. In a flash, what seemed like a bolt of lightning from above struck the Norwegian and he literally disappeared, leaving a slight smoke vapor where he had been standing. “I demand order. Two weeks ago I removed a large group of people from earth who were unstable and unable to fully embrace our leadership. A power that no one on earth had ever seen was present, and literally everyone in the room sat nervously, but obediently, motionless. Knowing little about him or where he was actually from made little difference at this point. PEACE continued, immediately addressing the problems surrounding the explosive situation with Israel and her neighbors. As PEACE walked confidently from the podium and departed the stage, the world press immediately geared up in support of this unknown but magnetic creature whose lineage no one knew. But in reality, no one really cared where he was from if he could bring peace and order. Besides, who could stand against PEACE’s mysterious cohort and constant companion that could make people disappear! Therefore a formal motion was presented and passed unanimously. Everyone knew giving PEACE authority was a moot point, but everyone felt it was in their country’s best interest to publicly show support. 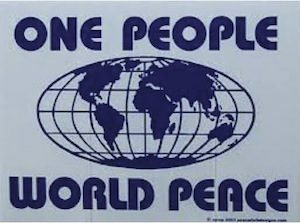 PEACE was fast becoming the new world leader. Bill Perkins is the founder and Executive Director of Compass International, Inc. © Copyright 1993-2014, Compass International Inc. www.compass.org / 800-977-2177 The above article may be forwarded in its entirety (including credits) without permission.